Expanded ecosystem delivers automotive radar libraries in an easy to use software development kit optimized for complex radar development. Reduces time to market for applications including Adaptive Cruise Control (ACC) and Automated Emergency Braking (AEB). 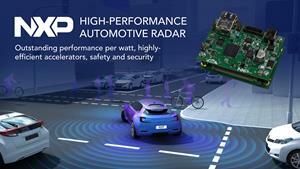 EINDHOVEN, The Netherlands, Oct. 02, 2018 (GLOBE NEWSWIRE) -- NXP Semiconductors N.V. (NASDAQ: NXPI), the world market leader in automotive radar 2, has expanded its radar ecosystem with an automotive radar solution that combines its S32R processors, RF Transceiver and Antenna design on a new reference platform. Created through a partnership with Colorado Engineering, the solution is the only currently available automotive-grade radar development platform designed to meet the stringent functional, performance, and safety requirements of the industry. This new radar solution is designed to accelerate the development and deployment of radar into production vehicles and includes a full ecosystem of tools that aim to lower development costs and spur radar application adoption worldwide. The NXP radar solution, featuring the S32R27 processor, the TEF810x CMOS transceiver, and the FS8410 Power management IC, is designed to help customers accelerate time to market by lowering the barriers of entry to radar application development with hardware, software and tools that ease radar implementations.